ژوانتسونق (اینگیلیسی‌جه: Emperor Xuanzong of Tang) بیر شاهزاده ایدی. سپتامبر ۷۱۳ ایل‌لر آراسیندا حؤکومت ائدیب. ↑ He ascended the throne following the abdication of his father Emperor Ruizong, who received the title Taishang Huang (retired emperor) but continued to wield actual imperial power until 713. ↑ Following the rebellion of An Lushan, Xuanzong's son Emperor Suzong was proclaimed emperor by the army on 12 August 756, but Emperor Xuanzong and his retinue, who had escaped to Sichuan, only heard the news on 10 September 756, that date marking the end of Xuanzong's reign in practice. 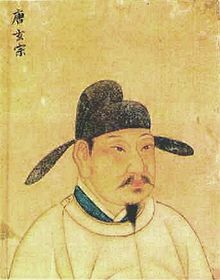 Until Emperor Xuanzong received the news of Emperor Suzong's ascension, he continued to issue imperial edicts as emperor. ↑ This is the name under which Emperor Xuanzong is most known in the Chinese-speaking world. See, e.g., this article from Wen Wei Po.